Great news! Clip ‘n Climb has opened a new flagship facility in July 2017! Clip ‘n Climb Plymouth showcases every last tool and Challenge developed by Clip ‘n Climb and is being run by the same amazing team that ran the former flagship facility in Exeter, UK: Ian Stocker and Laura Gemmel. Laura, what can you tell us about your team? How did you choose the people who turn Clip ‘n Climb Plymouth into a fabulous place everyday? ‘Ian [Stocker, Manager at Clip ‘n Climb Plymouth] has been involved with Clip ‘n Climb since its very first installation in Europe and myself shortly following. Over the years, we have gained a lot of knowledge in the product, customer experience, staff experience, safety and management. One of the most important things we learnt from running the centre in Exeter was the necessity of team work and supporting each other. If one part of the system doesn’t work it has a dramatic effect on everyone else. What is so special about Clip ‘n Climb Plymouth? ‘From our experience and from training in various Clip ‘n Climb centres we have learnt each centre has its own unique personality and each has to respond and adapt to the area. One thing which is consistent is the love of the challenges no matter how small. We are very fortunate to be located in a stunning building architecturally designed by Sir Nicholas Grimshaw. It is currently the youngest listed building (built in 1991). Our climbing arena has the most challenges in Europe and also houses the biggest Big Cheese ever made (The Really Big Cheese as it is formally known as in the centre, our standard Big Cheese is now known as Petit Fromage! [‘small cheese’ in French]). We also have a wall of shorter challenges so the younger climbers and more nervous ones have a chance to reach the buttons at the top. What has been your biggest surprise with Clip ‘n Climb? ‘At the beginning, we spent time responding and adapting to our market. We found Clip ‘n Climb was very popular for birthday parties as well as school groups, scout and guide groups. We found we had a lot of return customers, something which we weren’t anticipating. Everyone loved the challenges and would return again and again to develop their skills and better them. We found it wasn’t just children that were affected by this and the adults loved the competition! For this reason, we developed a scoring system and competition format which complemented the adult competitive nature and ran many team based competitions on event nights. We are starting from the same position here in Plymouth learning and responding to our market. We already have a similar pattern of repeat customers coming back to use the challenge system. We have also had a lot of interest and visits from our military neighbours and are currently developing a challenge based training programme to complement and aid their training on their repeated visits. ‘While climbing you are challenged mentally and physically and the benefits of this are astonishing. Climbing not only improves stamina, muscle strength, flexibility and agility, it also helps develop concentration determination and problem solving skills. All of these lead to greater self-esteem, self-control and ability to rise to a challenge! We have so many customers young and old returning to challenge themselves and each other and overcome fears. 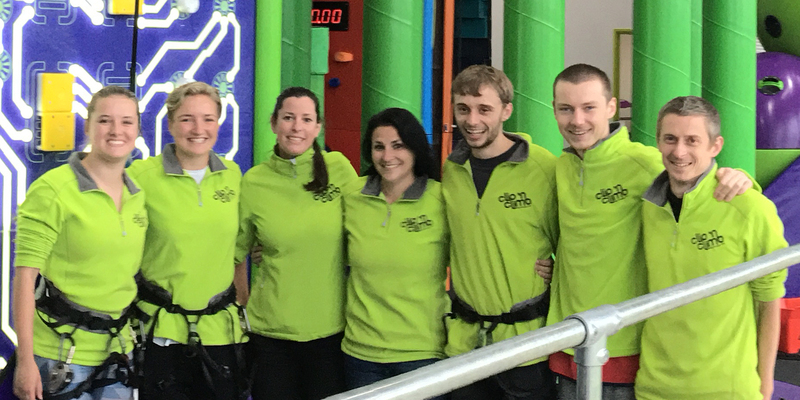 We wish Laura, Ian and their team an amazing time at Clip ‘n Climb Plymouth and thank Laura for taking the time. Come and visit them at Clip ‘n Climb Plymouth!